It says something rather endearing about AMG that for the unveiling of its all-new M178 4.0-litre twin-turbo V8 the first 10 minutes or so of the presentation focus on exhaust noise. There is some very serious and innovative engineering in this new motor. But Christian Enderle, head of engine and powertrain development, doesn't want to talk tech until we've sat through some sound clips of great AMG V8s of the past. 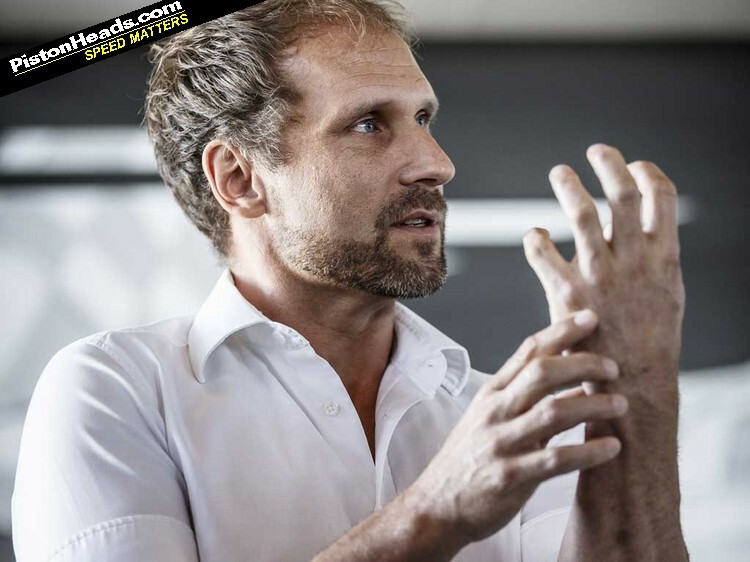 Studiously we sit there, pencils poised over notebooks as the room reverberates to the thundering 300SEL 6.9 Spa race car, the W124 Hammer, the SL55, the C63 and, finally, the new M178. Enderle nods at the end of it. "I think it is very emotional," he says, with utter sincerity. Seems PHers agree too. Someone mentions engine noise through the speakers. 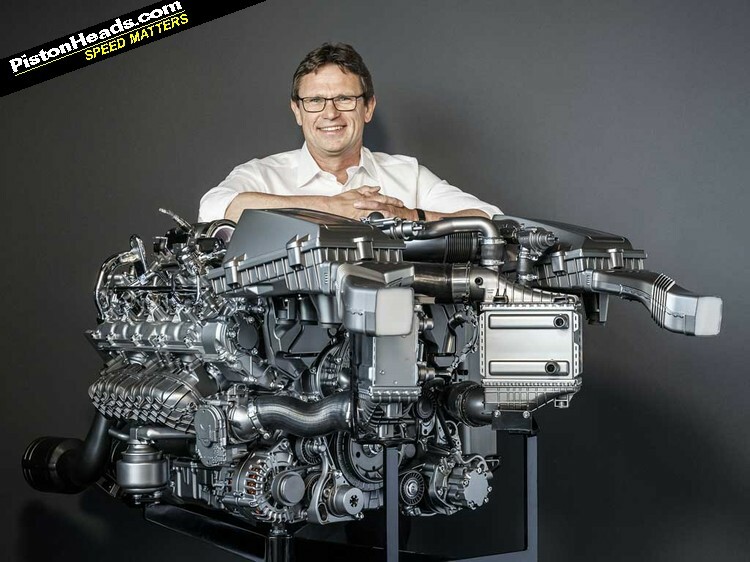 Enderle and engine development manager Jochen Schmid exchange glances and grin. "We do not have this." Flying journalists out to AMG's Affalterbach HQ to see an engine before the car it'll be installed in has even been unveiled seems a little excessive. But ahead of the Mercedes-AMG GT's official debut they obviously want some time for the new V8 to have its moment in the spotlight. And why not. 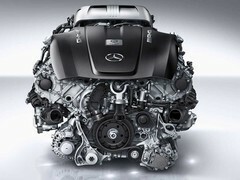 This is an important engine - it'll also feature in the C63's replacement and, all being well, future Aston Martins too. The headlines? 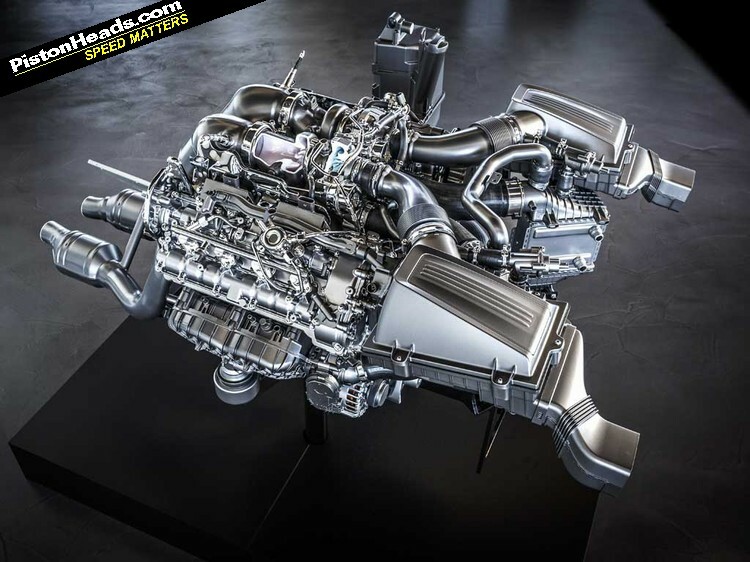 In the AMG GT trim shown to us the M178 is a 'hot V' configured twin-turbo V8 with the inlet manifolds on the outside of cylinder banks fed by single-scroll, fixed vane turbos placed between them. 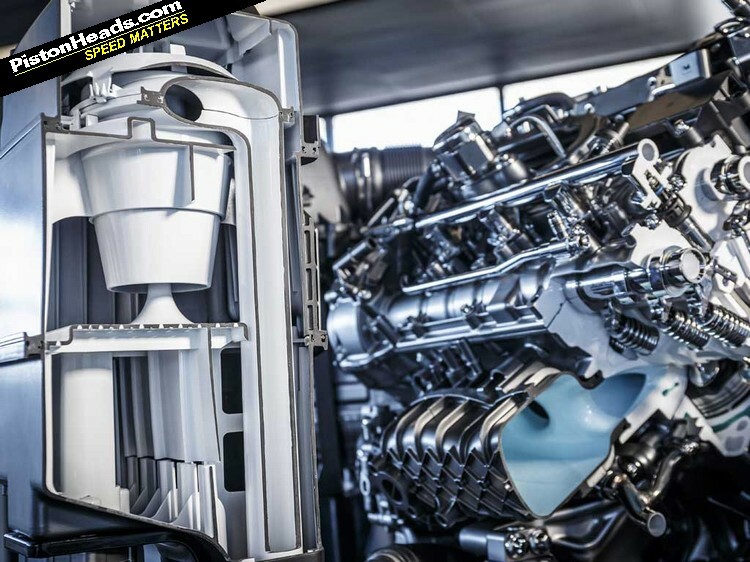 This follows the format of comparable engines from Audi (the 4.0 V8 in the RS6, RS7 and Bentley Continental GT V8) and the BMW M V8 in the M5 and M6 family, the main advantages being faster turbo spool-up and catalytic converter heating for response and emissions. Dry-sumped for the GT, it gets Mercedes-patented tech like 'Nanoslide' cylinder liners, Zirconium enhanced aluminium alloy cylinder heads and third-gen piezo direct injection. Perhaps surprisingly given the stated ambition for a normally-aspirated style high-revving response it's an undersquare design with 83mm bore and 92mm stroke and has a dual-mass flywheel, apparently necessary for refinement and to work with the GT's dual-clutch transmission. So far, so bewildering. Ready for some numbers? As it stands it'll do 510hp and 479lb ft - impressive numbers if pegged back from the mighty 585hp and 590lb ft of the more conventional 5.5-litre M157 V8 in the E63 and others. 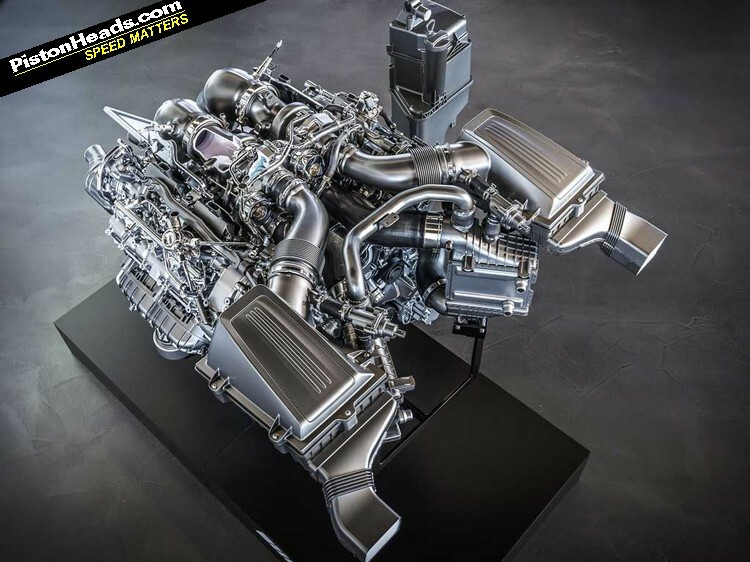 Audi's 4.0 does 560hp and 516lb ft in the RS6, the M V8 560hp and 501lb ft in the M5. 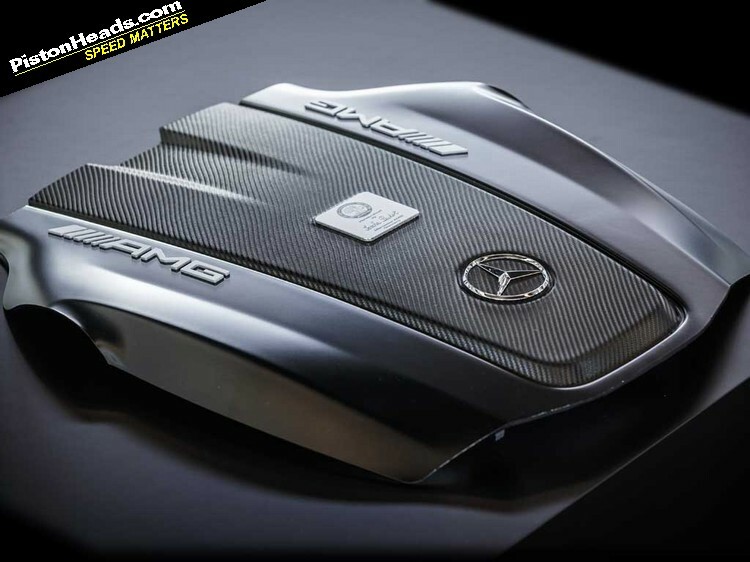 Don't be surprised to see those numbers increase as the M157 is gradually phased out and the M178 becomes AMG's core engine. And the much-loved M156 6.2-litre it replaces? 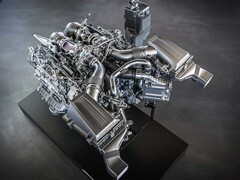 507hp and 450lb ft in C63 Edition 507 trim, 591hp and 479lb ft in M159 dry-sump form in the outgoing SLS Final Edition. All-in it weighs 209kg, just 5kg more than the M159. 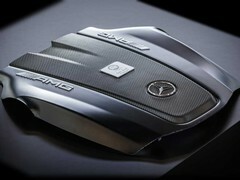 This is downsizing - not a word that comes easily to the lips of AMG engineers - but very much achieved on their terms. Was anything other than a V8 ever on the cards? Briefly, until they realised they could hit the emissions numbers with eight cylinders. "It had to be a V8," says Enderle, simply. "We have a V8 DNA in our engineers - we are proud of this point!" Along with noise AMG customers - and engineers - share a taste for naturally-aspirated style response and revs. 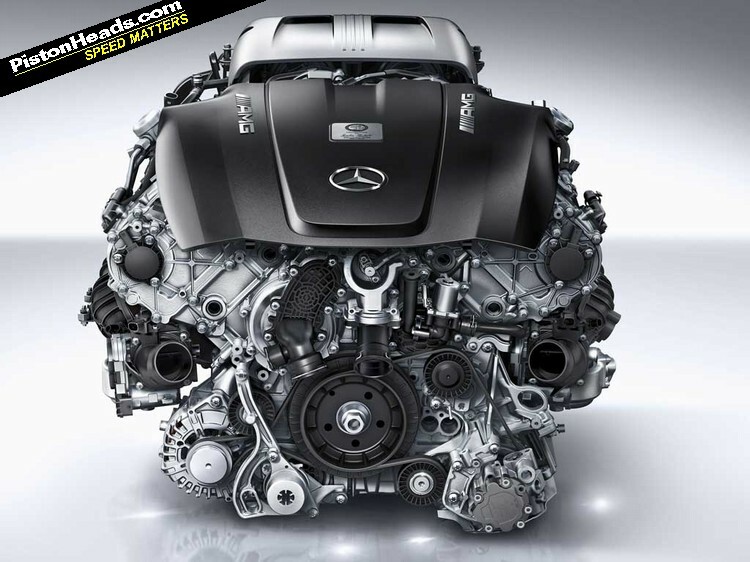 Not usually happy bedfellows for forced induction but an issue, like BMW M, AMG has had to face. "The engine is able to rev to 7,200rpm - you have the sporty feeling with high revs otherwise you have the feeling more of a diesel engine," says Enderle. "And that is not what we want." The new M3/M4 uses lots of clever features - including shutting off the ignition but keeping the turbos spinning - to maintain normally-aspirated style throttle response and, in the same mould, Enderle and Schmid affirm their engine does its best to disguise its turbocharged foundations. They're not offering specifics beyond saying there are 'strategies' within the induction system to achieve a similar effect. That surprising undersquare layout helps fill the gap in low-end torque before the turbos do spool up, the fact it also means smaller pistons and the focus on reduced friction allowing the 7,000rpm-plus redline. 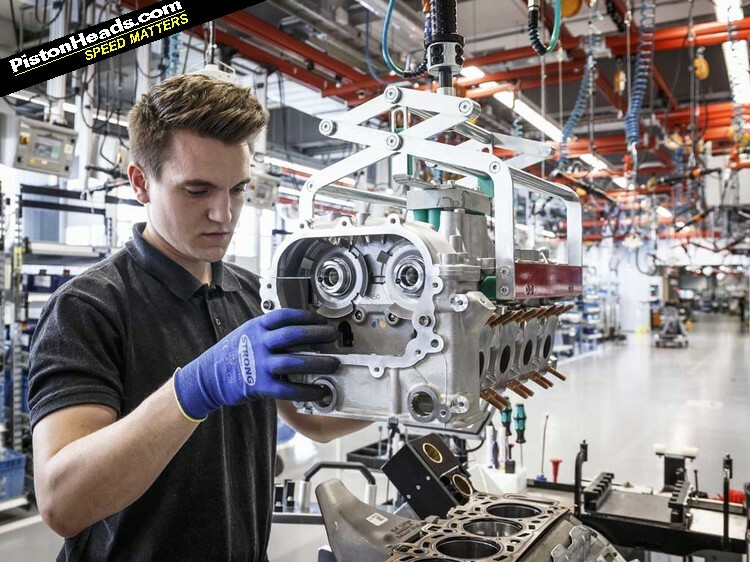 This, the boost and the burly 10.5:1 compression put a lot of strain on the block though, Enderle keen to point out it's pressure rated to 130bar where most typical petrol engines are to 100bar. This is one lesson learned from the 360hp four-cylinder in the A45 family and strains imposed by its crazy high 180hp per litre specific output - "We have always loved V8s, now we love four-cylinder engines too!" grins Enderle. The geekery continues apace, from the fact the Nanoslide bores (160microns thick compared to 2-3mm of conventional iron ones and better for both weight and cooling) are polished with diamonds to reduce friction and therefore oil consumption to the astonishing stat that the scavenge pump circulates the 10 litres of engine oil at a maximum rate of 65 litres per minute. Apparently that means the oil spends all of five seconds in the reservoir before going back into the engine. 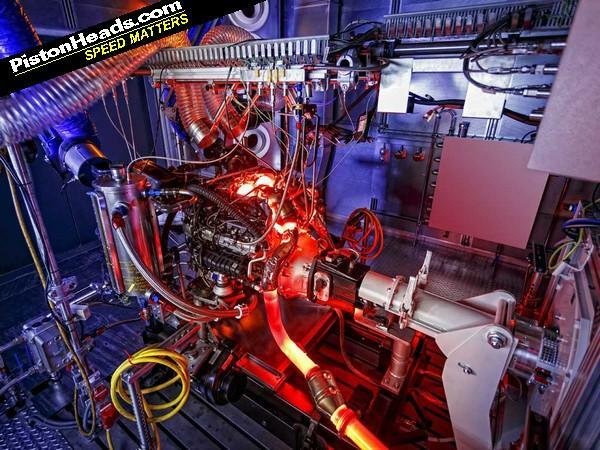 Suitably boggled we retire to AMG's engine test bench to witness the engine put through its paces. 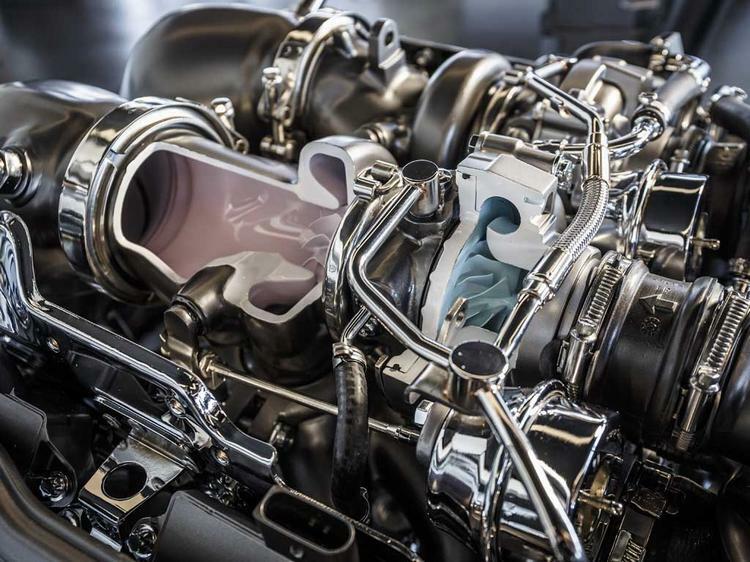 And see, first hand, why the term hot V is so appropriate - it's not long before the turbos are glowing red hot with 900C exhaust gases as real-time driver telemetry 'drives' the engine on a lap of an undisclosed test track. We're even treated to a taste of the noise with the door opened. There's a damped breathiness to the cylinder detonations that will never equal the hard-edged crackle of the old 6.2 but it's still unmistakably V8 with an underlying bass that hits you in the chest. And, yes, contrived cylinder cut out and other tricks mean it'll bang and pop on the overrun, if not quite as manically as the A45. Swabian modesty prevents any fist pumping or back slapping - at least in front of us - but the fact both Enderle and Schmid have worn permanent smiles throughout the presentation suggests when the proof comes in the driving we won't be disappointed. 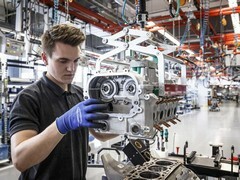 And though there's genuine remorse at the passing of the normally aspirated, big capacity era the guys at Affalterbach seem confident they've carried their V8 addiction into the modern age without sacrificing too much of the old character in the name of progress. You cannot help but be impressed at the engineering. But, like all these cgi films, in 15 years the tech will be old, the numbers conservative and the sound ordinary. "What's this b d f king heatsheil here for? it's taken an hour to remove it and it does nothing. FLUNG. Not putting that t tting thing back on...."
2 years later; engine grenades. Cause; fuel starvation due to lack of insignificant (flung) or bent heat shield - result; melted pistons? As I see it, our UK garages can't diagnose and fix 10 year diesel tech. I see little hope for the longevity of these engines, let alone this. Cut a big hole in the bonnet, à la GTHO Shaker, and tear down the autobahn to watch the turbochargers glow orange and white! "Don't be surprised to see those numbers increase as the M157 is gradually phased out and the M158 becomes AMG's core engine." Other than that I "think" I like it, but suprised it's even initial power output isn't higher considering it's essentially two A45 engines in a V, non?